Pedestrians represent about 14 per cent of all road fatalities in Ontario. The Office of the Chief Coroner for Ontario recently released a study of Pedestrian Deaths that occurred in Ontario in 2010. The watchword of the report was ``We speak for the dead to protect the living.`` The purpose of this study was to analyze events that led to fatalities for pedestrians and subsequently to make recommendations for changes in driver and pedestrian behaviour, community infrastructure and legislation that reduces pedestrian injury and death in this province. A similar concern is work-related roadway collisions. Motor vehicle collisions are a leading cause of workers` fatalities and injuries. Employers must take reasonable care and precautions to protect their workers while on the job. Some professions, such as road construction workers, landscapers and road maintenance workers are particularly at risk of motor vehicle collisions. All of us are at some time or another pedestrians, whether in the process or commuting, working or involved in recreational pursuits. In any of these activities, pedestrians should expect to be able to walk and work safely. 33 per cent of the pedestrian deaths studied in the Chief Coroner`s Report were caused by a careless driver who committed a driving infraction just prior to the crash. In 30 per cent of pedestrian-motorist collisions, charges were laid against the driver under both the Criminal Code and Highway Traffic Act. A 46 year old Rockland citizen and father of two suffered fatal injuries after being struck by an SUV along Highway 174 in August of 2015. Mr. Blake`s family-run business in Rockland was under contract for the City of Ottawa, and he was working on the median on this extremely busy roadway when he was struck. The male driver of the SUV sustained serious but not life-threatening injuries to his head, face and back. While still investigating this tragic incident, Ottawa OPP commented that it is unknown whether speed was a factor in the accident; however, there have been numerous collisions in Ottawa construction zones which resulted in 212 injuries between 2007 and 2011. The Ontario Ministry of Labour is also involved in the investigation of the crash. This accident follows a similar incident that occurred in Burlington in May 2014 when three city workers were struck while landscaping on a centre island median. In this instance, a 51 year old driver lost control of his car and drove over the median. Two male workers, 19 and 22 years of age, were transported to hospital with critical injuries; a 34 year old woman sustained non-life-threatening injuries. The magnitude of collisions and injuries to road workers highlights the problem that many motorists are driving too aggressively and not taking due care when driving past sites where road work is being done. Speeding and aggressive driving are similarly a common factor in many collisions with pedestrians. Pedestrians are the most vulnerable of road users, yet sometimes contribute to situations which put themselves at risk of being struck by a motor vehicle. Some pedestrian actions that are contributing factors in collisions are when a pedestrian unexpectedly crosses an intersection against a red light; when a pedestrian emerges mid-block from an obstruction such as parked cars; or when a pedestrian is impaired and engages in entirely unpredictable behaviour. Vehicle speed (Drivers who are speeding or driving fast are less likely to react in time when a pedestrian is crossing). Enforcement of targeted driver behaviours such as speeding, failure to yield, running red lights and distracted driving. Reduce speed limits on city streets. The vast majority of pedestrian collisions (76 per cent) occur in urban areas and speed is a factor in many of these. Install pedestrian signal intervals at intersections where there have been many collisions. Implement strategies to prevent collisions with pedestrians at the side of the road. Add sidewalks where there are none. Pedestrian count-down signal times and auditory signals. Automatic traffic enforcement systems strategically located. Reduce the number of travel lanes. Additional lighting at intersections and on both sides or arterial streets. Changes to infrastructure and enforcement can reduce the likelihood of pedestrian-motorist collisions. However, the most significant reduction will be realised only with changes in driving behaviour. By reducing our speed in pedestrian and worker zones, keeping our attention on the road, and being respectful towards other road users, every driver can play a part in ensuring that walking is a safe activity in our communities. Ontario law requires that motorists take due care with respect to pedestrians due to the higher vulnerability of pedestrians as road users. Pedestrians who were seriously injured in a motor vehicle collision have a right to make a claim for damages against the motorist who was negligent in the accident. Families who lost a loved one in a motor vehicle collision may also sue the person responsible. 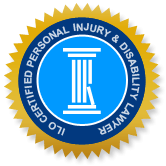 The Injury Lawyers of Ontario (ILO) law group is an experienced team of personal injury lawyers with connections in local communities, such as Ottawa and Rockland, throughout the province. We have dedicated expertise and knowledge in `tort law` (negligence suits) and accident disability benefits claims. Our goal is foremost to help accident victims and their families during the challenging time in the aftermath of a serious accident. Call ILO today for a no-obligation consultation which will allow you to have your questions answered and to understand your options for making a claim. We will commit to getting you the benefits and compensation you deserve.